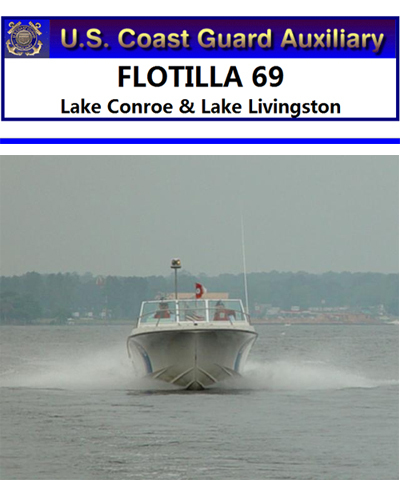 Flotilla 69 is part of the United States Coast Guard Auxiliary. The Coast Guard Auxiliary was established by Congress in June, 1939, to assist the Coast Guard in promoting boating safety. It is composed of nearly 35,000 members from all walks of life who are drawn together by their love of the water and a willingness to serve other boaters. Its members receive special training so that they may be a functional part of the Coast Guard Team. Lake Patrols, Vessel Examinations, Boating Seamanship and Safety Classes, Marine Dealers Visitation, Public Education, Communications, and Navigation. We are dedicated to helping boaters, on Lake Conroe,Texas, have a safe and enjoyable experience on and off the water.